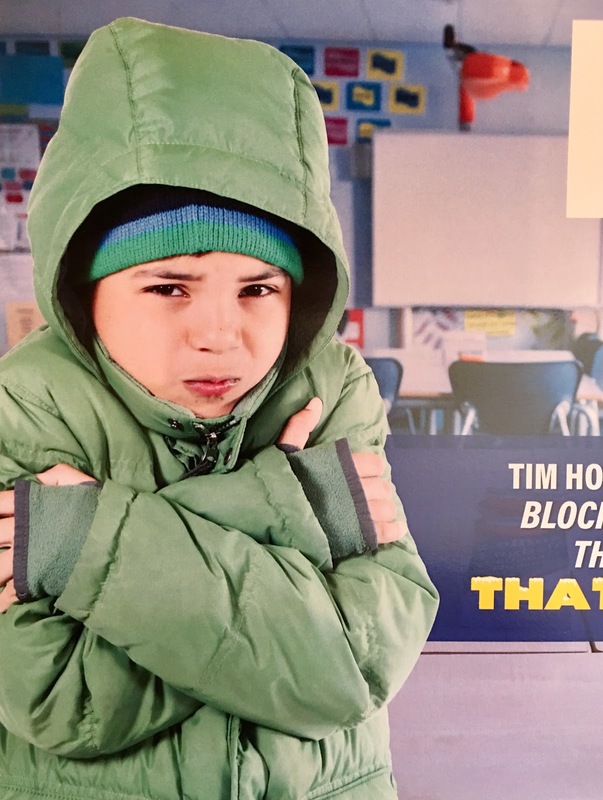 A flier sent to Hackensack homes this week shows an elementary school student trying to keep warm. 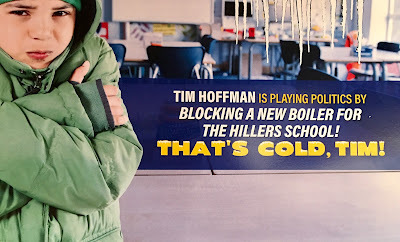 The illustration dramatizes the loss of heat at the Fanny Hillers Elementary School, where "kids and teachers had to bundle up in coats, hats and gloves during some classes" this past winter. 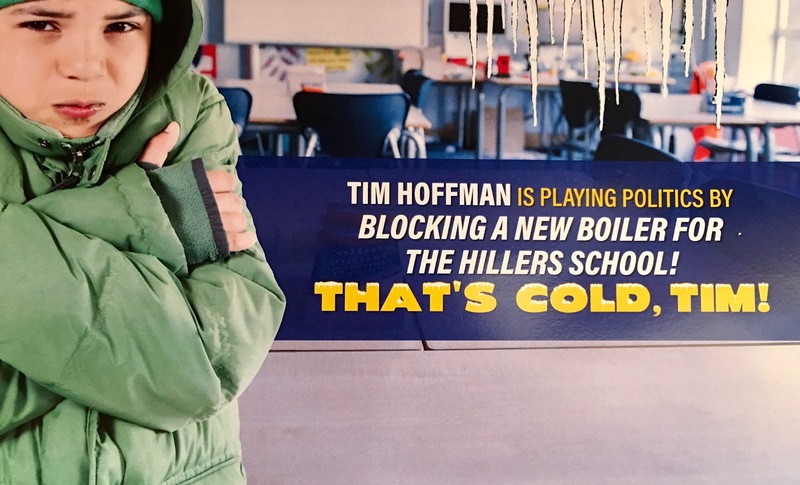 Opponents blame Vice President Timothy J. Hoffman, who is seeking a new 3-year term on the Board of Education, for failing to include $1.7 million in the proposed school budget for a new boiler at the Hillers School to avoid a repeat of what happened this winter. 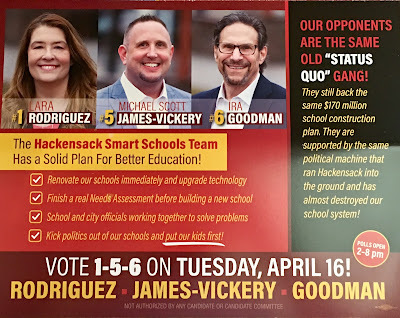 HACKENSACK, N.J. -- Opponents of Board of Education Vice President Timothy J. Hoffman in Tuesday's election say he still is angry "his prized $170 million referendum was crushed by voters in January." The Smarts Schools team led by board President Lara Rodriguez want to take $1.7 million from "new school construction funds" in the proposed budget, and use it to buy a new boiler for the Fanny Hillers Elementary School "in time for next winter." But they claim the Hoffman team "flat out lied and said money for the new boiler was in the budget, then ... admitted that it's not." 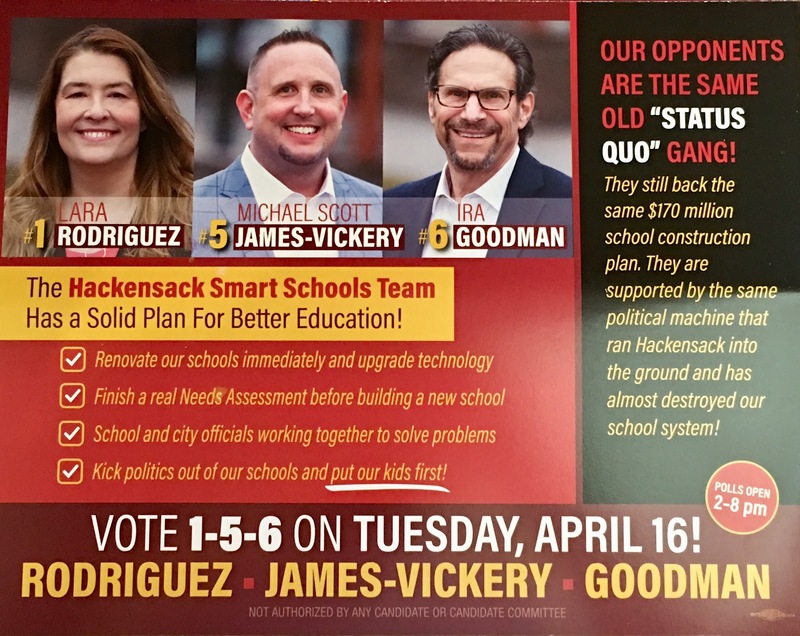 Rodriguez, Michael Scott James-Vickery and Ira Goodman are running under the banner of Hackensack Smart Schools, the residents group that allied with the City Council to defeat the grandiose $170 million school construction and renovation plan, which was on a special election ballot Jan. 22. To pay for the work, taxpayers would have been hit with a tax hike of $308 to $650 and more a year for 30 years. Hoffman's running mates are Yvette Washington Irving and Basim Assad. Voters can choose 3 candidates to serve 3-year terms on the 9-member board. Residents also will be able to vote "yes" or "no" on the proposed $84.5 million tax levy to support a budget of $126.5 million for the 2019-20 school year. If the budget is rejected, the City Council can make cuts in the plan. About 45% of every property tax bill in Hackensack goes to support the schools. Polls will be open on Tuesday from 2 p.m. to 8 p.m.
Board of Education President Lara Rodriguez, left; Michael Scott James-Vickery, center, and Ira Goodman are running under the banner of Hackensack Smart Schools, a group of residents that mobilized to defeat a $170 million school construction and renovation proposal in January. See their ballot positions, below. 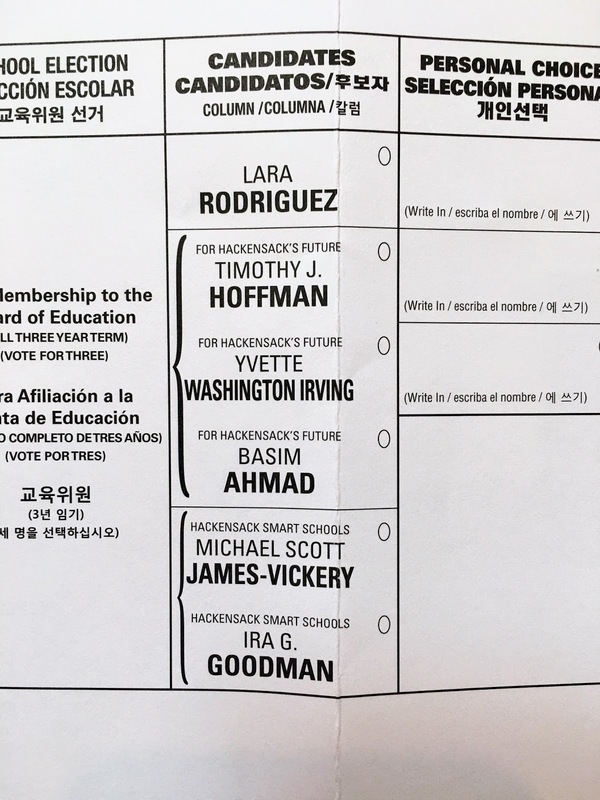 Lara Rodriguez, president of the Board of Education, is at the top of the column of candidates, and her running mates are at the bottom. Voters also can vote "yes" or "no" on the proposed $84.5 million tax levy to support the proposed $126.5 million budget. 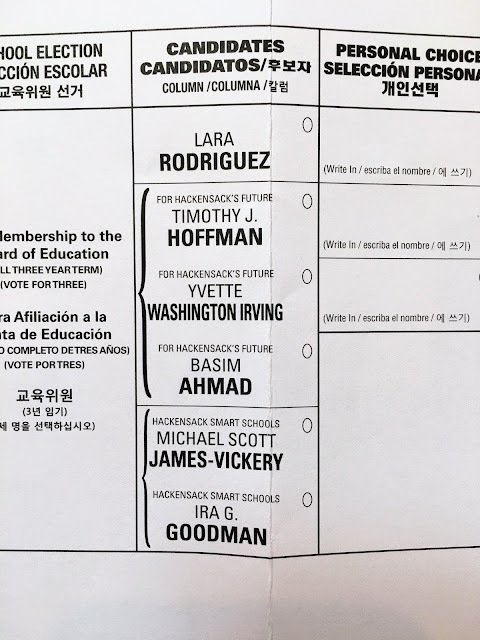 That portion of the ballot isn't shown.